Is your parrots feather plucking causing you to pull your hair out with frustration? Below are some natural treatments to rehabilitate your pet bird. As we have learned in the previous article, there are many different causes of feather plucking in parrots. In order to treat your bird effectively, you need to treat the cause and not just the effect. Products such as feather pecking sprays, which have a foul taste, and feather protectors that cover or prevent your bird from reaching his feathers, will discourage or prevent plucking, but do not resolve the underlying cause of the problem and are therefore a short-term fix rather than a long-term solution to the problem. Anyone that owns a feather plucking parrot needs to initially determine whether it is a result of physical stress related to health, diet or hygiene; or whether the feather plucking is as a result of emotional stress resulting from boredom, separation anxiety, loneliness, or due to some dramatic change in your birds environment. Treating your parrot with natural homeopathic remedies is a safe way to tackle feather plucking. Moisturising sprays that contain aloe extracts have natural soothing properties that help relieve skin irritations, and dry skin. Stress can also be treated with homeopathic solutions, such as Bach Flower remedies containing extracts of Passion Flower, Kava Kava or St John's Wort, which are natural sedatives, and have a calming effect on birds. Another natural ingredient that is useful for treating feather plucking that is caused by skin irritations is Grapefruit Seed Extract (GSE), which has natural antiseptic, antibiotic, and anti-parasitic properties. Natural dietary supplements, such as Vitapet Feather Conditioner are specially formulated and contain a range of essential vitamins to maintain a healthy feather condition. They are particularly useful for birds that are suffering from a vitamin D deficiency due to being fed an unbalanced diet, and as they will aid feather regrowth, they are beneficial for any bird that has plucked out its feathers. Ensure that your parrot gets a healthy, balanced diet to maintain healthy plumage. Keep you bird in a healthy environment, bearing in mind that cigarette smoke and aerosol fumes are toxic and can trigger feather pulling behaviour. Also make sure that your bird is kept in an area that receives adequate light, that he does not get too hot or too cold, and that the humidity is not too dry. Parrots hail from tropical rainforest, and heaters can dry the air in the room. When using heaters, it is recommended that a dehumidifier, or a water feature of sorts, is provided to prevent the air from becoming too dry and thus drying out your birds skin and feather follicles, resulting in irritation and feather plucking behaviour. Your bird needs eight hours of beauty sleep a night. Keep him covered in a quite corner if you plan to party all night. Stimulation is vital, so provide lots of interesting toys and puzzles to keep him occupied and prevent boredom. Social interaction is very important. Preferably let your bird out of his cage to interact with you on a daily basis. Provide other stimulation, such as music, when you are not around so that he doesn't sit alone in a quite house – very dull for a pet parrot. Consider get another parrot to keep your pet company if you work all day and he has to stay at home alone. By following all the above tips, your bird should be kept happy and content, and should not resort to feather plucking due to health or psychological stress. Feather plucking is a common problem among captive pet parrots. Some species, like the African Grey, Cockatoos, Macaws, and Quaker (Monk) parrots are more inclined to pull at their feathers. The severity of feather plucking can range from feather picking, where the bird just breaks the feathers off resulting in a rather unkempt looking parrot; feather pulling, where the parrot pulls the feathers right out, leaving bald bits of skin exposed; and self mutilation, where the bird tears at its own flesh, resulting in bleeding sores that can easily become infected if not attended to swiftly. Often feather picking, may progress to feather pulling and finally self mutilation, so it is advisable to check this habit as soon as possible to prevent the situation from deteriorating. There are several factors that may cause a parrot to begin plucking at its feathers, and these can include both physical and mental stress. Physical stress can be related to an unbalanced diet, external or internal parasites, or allergic reactions to an environmental stimulus or toxin. Due to their high level of intelligence, parrots are very prone to mental stress and anxiety, and often start pulling at their feathers when they are bored, lonely, or have experienced a sudden change in surroundings or environment. Should your parrot begin plucking at his feathers, it is advisable to take him for a veterinarian examination as soon as possible to determine the underlying cause of feather plucking in case it is related to a health issue, such as internal or external parasites, or an infection. It is very common for birds that are fed a diet high in sunflower seeds to suffer from a protein and vitamin A deficiency, both of which are necessary for maintaining healthy plumage and skin. As a result, the birds experience problems moulting, and consequently suffer irritation at the feather follicle, which stimulates feather pulling behaviour. A high quality, commercial pelleted diet, such as Vitakraft Parrot Premium Menu, that contains all the essential proteins, minerals, and vitamins is recommended to prevent, and cure feather plucking behaviour stemming from malnutrition. Skin parasites are generally uncommon in pet parrots that are housed indoors, but convenient preparations, such as anti-parasite spot-on treatment, are commercially available for small, medium and large parrots to prevent external parasites such as skin mites or lice, and also combat internal parasites such as round worms. There are many common substances that we use daily in our homes that could cause an allergic reaction, or high levels of discomfort to your parrot that would induce stress related feather plucking. Cigarette smoke, air fresheners, and cooking sprays are all toxic to parrots and may cause high levels of distress. Parrots are very intelligent, sociable by nature, and highly active birds. If they lack stimulation or companionship, they may become bored and lonely, resulting in feather plucking behaviour. Provide your parrot with a variety of toys, ranging from toys that are mentally stimulating, such as shakers, food balls, and puzzles; to those that provide physical exercise, such as swings, ropes and ladders. Spend quality time with your parrot, providing interaction and companionship. If your parrot has to spend the day alone whilst you are at work, it would be kinder to consider getting an avian companion for him to communicate with in your absence to prevent loneliness and depression setting in. Feather plucking can be prevented, and usually cured, by providing your parrot with plenty of mental and physical stimulation, a healthy diet, a healthy environment, and lots of love and attention. Those are the ingredients for a happy, healthy parrot. It can be quite confusing choosing a cage for your pet conure, as there are a wide variety of cage types on the market, and determining which one is the most suitable for your bird is often quite a challenge. Although there are many different species of pet conures, they all have similar housing requirements. They need a spacious, sturdy, and durable cage that will stand up to the abuse of a conure's strong beak, which is used as an aid in climbing. You should strive to provide your bird with the biggest cage you can afford and comfortably accommodate in your home. Special care should be taken when choosing a cage to ensure that the cage bars are non-toxic. Galvanized metal, or stainless steel cages are recommended. Stainless steel food bowls are better than plastic bowls, as they will not only last longer, but they are easier to clean and more hygienic. Decide whether you wish to be able to move the cage around the house with ease. A large cage on castors is easier to move around than one without wheels. Ultimately, the size of the cage required will be determined largely by the type, and size of your pet conure. Smaller conures don't need as big a cage as larger conures, but will certainly be grateful for as much as you can give them. Generally bigger cages tend to have a wider bar spacing, so if you are shopping for a cage for a small conure, it is important that you take note of the bar spacing, as this needs to be narrower than the bar spacing on cages for larger conures. In you efforts to provide your feathered friend with as big a cage as possible, this is something that may easily be overlooked. Small conures (Green Cheeked, Maroon Bellied, Black Capped, Dusky, Half Moon, Peach Fronted) minimum cage size 20 inch wide x 20 inch deep with a 3/8-1/2 inch bar spacing. Medium conures (Sun Conures, Jenday Conures, and Nanday Conures) 24 inch wide x 24 inch deep with a 1/2-3/4 inch bar spacing. Large conures (Patagonian Conures) 30 inch wide x 30 inch deep with a 3/4-7/8 inch bar spacing. Flight cages offer extra length to allow your bird free flight across the cage. Double flight cages not only provide extra length for flight, but also offer extra height for climbing and provide more room for toys, or to hang a cosy bird hammock for your bird to snuggle into when he goes to roost. Flight cages are usually fitted with narrow spaced bars and narrow gauge wire, so are more suitable for small conures. Dome-top cages offer extra height giving your bird more space for climbing, or to place toys or a sleeping hammock, making them ideal if your bird spends a lot of time in his cage while you are at work. Play-top cages are fitted with an external on-board activity area on top of the cage. The built-in play-gym often comes complete with toys, swings, ladders, extra perches, and food and water bowls, which can be very handy if your conure is likely to spend a lot of time out of his cage. Aviary cages are large indoor or outdoor cages that provide the most natural environment for a caged pet bird. Their large size can accommodate natural branches, lots of toys, making them ideal for both small and large conures. Aviary cages range in size, and can be fitted on a patio, in an entrance hall, or in a sheltered outdoor area. They can provide an interesting feature and focal point to an indoor or outdoor area, but they obviously have some limitations in terms of both space and financial outlay required. Ultimately, when choosing a cage for you pet bird, you need to select a cage that is most suited to your conures requirements, and that will best fit into your lifestyle, while at the same time making your birds comfort a top priority. Conures are very sociable by nature, and love interacting with their owners, which is one of the reasons they are so popular as companion birds. However, because they constantly crave human interaction, they can be quite demanding of your time and attention. Hand-raised conures make fantastic pets, mainly because they are imprinted on humans, and quite honestly, believe that they are human. Some species, such as the sun conures, can become extremely vocal in their efforts to get your attention, and this is something that should be considered before taking on the responsibility of a bird that requires lots of love and attention. If you are unable to commit a good deal of your time to a companion that will reward you with lots of pleasure, then rather consider getting a less demanding pet, as a neglected conure will result in stress for both the bird and the owner. It is best to provide your conure with a well balanced diet consisting of whole grain cereals, fruit, vegetables, nuts and seeds to keep it in a healthy condition. Commercial seed and pellet mixes should be supplemented with fresh fruit and veggies. Fresh apple, corn on the cob and sprouted seeds will all be relished by your pet conure. Commercial pigeon mixes, consisting of corn, a variety of peas, and sunflower seeds can be cooked up and fed to your conure as a healthy part of his daily diet. Avoid feeding you conure milk products, which can cause sour crop. Chocolate, alcohol, and onions are also a no-no, and avocado pear, is highly toxic to parrots, and can kill your bird instantly, so never ever let your bird eat avo. Keep you conure's cage away from draughts and out of direct sunlight. Place his cage in a central area of the house so that he is part of daily household activities. Tobacco smoke, aerosol fumes, and household cleaners can all negatively affect your bird's health, so try to avoid these around your bird where possible. Your bird needs plenty of sleep, so if you are a night owl, make sure your bird's cage is covered, and placed in a quiet dark corner at night time so that he rest undisturbed. If your conure is going to spend a lot of time out of his cage, consider trimming his wings so that he cannot fly off into the sunset. This is for his own good, as he may fly into a window and injure, or even kill himself; or fly off, where his chances of survival are limited. If your bird is to be housed in an aviary, then wing trimming is not recommended, as free flight is necessary. Although conures are small in size, they require a fairly large cage as they are active birds and require lots of stimulating toys to prevent them becoming bored. A small cage would quickly become too cluttered and restrict their movement. There are some wonderful cages on the market that offer open-up play-tops or play-gym combinations allowing your bird to move in and out of the cage freely. Choose a sturdy cage, that will withstand the wrath of your conure's beak. When choosing a cage, avoid painted or plastic coated wire cages as your conure will chew at the bars and can ingest this, which can compromise his health. Choose a cage with a bar spacing suitable for the size of your bird. Smaller conures require cages with a narrow gap between bars to prevent them escaping. Finally, look for a cage that is easy to clean. Conures are extremely playful, intelligent, and active, so provide a range of toys to keep them stimulated. These can included chew toys, such as rawhide and wooden toys; things they can climb on, such as ropes, chains, and wooden ladders; toys that make a noise, such as bells and shakers; and swings, which give them hours of pleasure, and provide good exercise too. 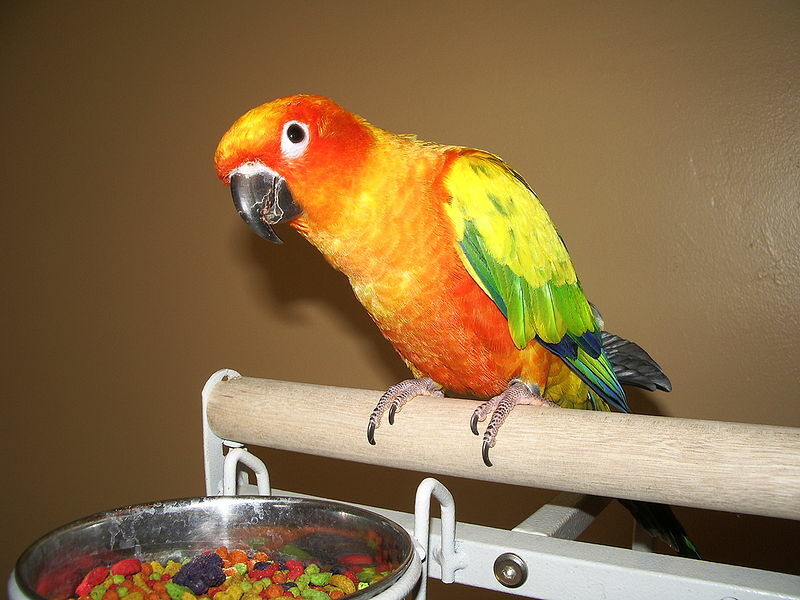 Conures are extremely playful and fun-loving. They have a mischievous air about them, and can be real clowns. They are intelligent and will learn tricks very quickly. They often roll over onto their backs in the palm of your hand. Conures also tend to be real water babies, so keep a spray mist bottle handy in hot weather, and provide a bird bath for them to splash around in. They will even join their owners in the shower, but just be careful not to overdo it, and make sure they dry off in a warm, draught-free area. Conures come in a variety of species, sizes and colours. They are all full of character and make excellent companion birds and are thus popular as pets. Lets take a look at some of the more popular types of conure that are kept as pets. The sun conure must be one of the most beautiful birds on the planet. With its bold predominantly yellow body, accentuated with bright orange highlights on the head and underbelly, green splashes of colour over the back and wings, and deep blue highlights on the tips of the wings and tail, this a truly stunning bird to behold. 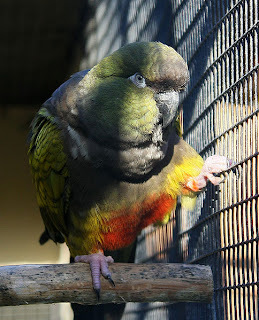 It is one of the medium sized conures, but what it lacks in size it makes up for in personality and voice. Although they tend to be rather screechy, sun conures are very alert birds, and this characteristic makes them very good “watch dogs” as they will alert you to anyone approaching your property. They are very loving and playful, and love to snuggle into their owners neck. They can also be quite demanding as they crave constant attention. The sun conure requires lots of love and companionship, and as it is quite a noisy bird, it is not recommended for those that have neighbours living in close proximity. The Jenday Conure is often confused with Sun Conure as they are very similar in both size, colour, and character. However, the colouration of the Jenday Conure, is set out in distinct patches of colour as apposed to splashes of colour coving the entire body. It has a bright yellow head, with bright green on top of the body and wings, while the underside is a deep orange to red, with green and blue tail feathers. The Maroon Bellied Conure is a small conure, with a dark green body, and a yellow-green striped chest. Not surprisingly, its belly is maroon, while the wing feathers are blue-green in colour, and the tail is green on the upper side and maroon on the underside. It has a patch of light brown on both the sides of the head. These little conures are very sociable, and like most conures they are extremely intelligent, affectionate, love to play, and will constantly seek attention and interaction with other birds and/or their owners. Their social nature makes them suitable for communal aviaries. The maroon bellied conure is one of the quieter conures, which generally are notoriously noisy birds. Their less vocal nature makes them the perfect companion for apartment dwellers as they tend to natter and chatter away rather than screech for attention. The Green Cheeked conure is often confused with the Maroon Bellied Conure as they are very similar in colour and nature. However, while the Green Cheeks also have a predominantly green body, they have grey breasts, maroon tails and blue primary flight feathers. The top of the head is a dark grey colour, and as their name suggests, they have green cheeks. 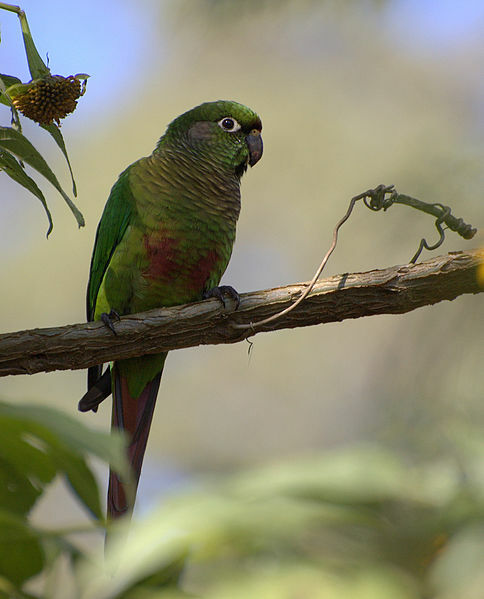 The Peach Fronted Conure has a predominantly bright green body, with a grey-green chest, with the underside being a light shade of green. The top of the head is bright orange, with blue extending down the sides of the crown around the eyes. The rest of the head, body and tail is green, with blue tips on the tail and black tips on the wings, and a black beak that distinguishes it from the Orange Fronted and Half Moon conures. The Peach Fronted Conure is a very sweet natured parrot. Like all conures, it loves to cuddle and play. They also tend to be fairly quiet as conures go, so will make an ideal companion for apartment dwellers or those not partial to the demanding nature of some of the other conure species. The Patagonian Conure is the largest of the conures species, and can reach up to 20 inches in size. The body colouration is mostly olive green-brown, with a grey chest, a patch of bright orange-red on the belly, and red “socks” on the legs. It has a ring of white around the neck, and blue edged wing feathers. Patagonian conures tend to be extremely vocal, and while their noise may not be welcomed by everyone, the upside is that they make good talkers. They have the playful, affectionate nature of the smaller conures, combined with the large size and ability to mimic and talk, which makes them popular pets. If you are looking for a wonderful affectionate companion bird, the conures come highly recommended. Their smaller size make them easy to keep, and while some species tend to be rather noisy, they have great personalities that tend to overshadow this minor irritation. As they are highly intelligent and playful by nature, they need to be provided with plenty of toys for stimulation, and a cage large enough to accommodate them and all their "parrotphernalia". Unfortunately arthritis is a disease that isn't just inflicted upon the human race. Sadly it is a very common medical condition in both humans and animals. Essentially it is an inflammation in a joint, and it can affect any part of your dog's body. The major effects are pain, problems in moving, and swelling of the joints. The wear and tear of normal daily use of the joints is a big reason. Other reasons can be obesity, joint infections, dislocation, immune system illness, muscle, ligament or tendon injury. The most common breed of dogs that suffer from this disease are Retrievers, German Shepherds and Labradors as arthritis is also an inherited disease. Each joint has two or more bones near each other. At the end of these bones is articular cartilage this gives a smooth area for the bones to move against each other. A thick fluid in the joint acts as a lubricant and shock absorber, and this then helps to protect the bones from any kind of grinding action. As the arthritis develops, the cartilage becomes rough and worn, and the joint fluid starts to thin and become watery. Movement becomes uncomfortable as there is less lubrication and smoothness in the joint, as the cartilage continues to wear away, bone will eventually rub on bone. So how can you give your dog the best chance of avoiding arthritis later in life? Firstly weight control is vitally important. We all love to spoil our pets but their health should come before anything else. Obesity puts a massive strain on your dogs joints and limbs. Losing a bit of extra fat will provide immediate relief. The extra weight will cause the cartilage to disintegrate rapidly. There are cases of overweight dogs developing arthritis as young as 5 years old, so look after them now. Keeping them weight free gives them a better chance in their senior years to bypass arthritis. Keep your dog active. The onset of arthritis in your dog can be delayed with plenty of exercise. A walk around the streets isn't really enough. A good run in the local park will keep their weight down and keep their joints limber. The natural fluid in the body will help to lubricate the joints and limbs. However, if your dog already has arthritis then little and often is more appropriate. When walking if your dog stops to rest don't push them to do more. Two walks a day, no longer than fifteen minutes each should help. Keep your dog on easy routes such as flat, smooth paths, no hills. Just as humans find swimming helps arthritic joints, so do dogs. Also they usually enjoy it. Obviously once arthritis has set in you can't do anything to cure it. All you can do is help prevent it from developing too quickly. You can make your dogs life easier by giving them a soft bed with an orthopaedic foam base. Most pet shops and pet sites have a good selection to choose from. Brush their coat where they may have difficulty in reaching. Keep their bowls at a slightly higher level than before so they don't have to strain to feed. A healthy diet will also provide nutrients that your dog needs. There are many brands of pet food that now cater for senior dogs. In terms of medications and herbal supplements to help with your dogs arthritis, it is always best to consult your vet.